This Smart Home Security Camera Kit from Netgear allows you to create an entirely wireless home CCTV system that can be monitored remotely on your smartphone. The kit itself is comprehensive yet simple, with everything you require to set up a video surveillance system in your home. The plain white casing blends in with almost any home and of course the wireless capability means you don’t have to redecorate after running cables all over your home. The camera can be paced anywhere using magnetic wall and table mounts then when mounted, it can capture high quality HD video footage, even at night thanks to infra-red technology. 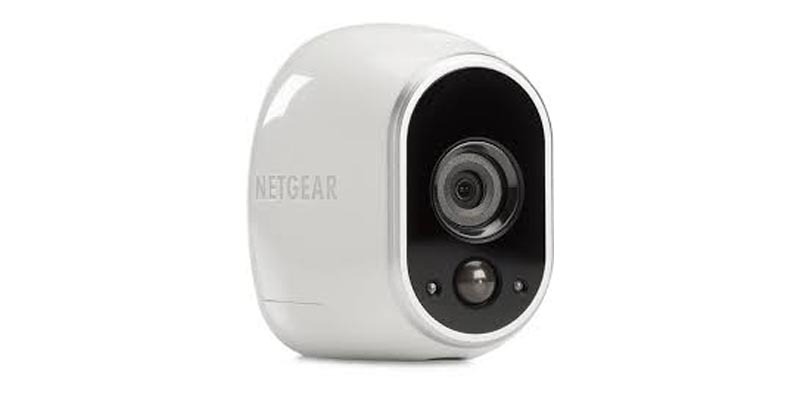 The NETGEAR Arlo VMS3130 kit is suitable for both indoor and outdoor use, so you can place the camera(s) exactly where you think they will be most effective, the weatherproof casing means that the cameras can survive pretty much anywhere. You can stay connected with your NETGEAR Smart Home Security system with real-time updates and recorded moments triggered by motion sensors and remotely viewed on your iOS or Android smartphone, so even if you’re at the other side of the world, you can always know what is happening in your home. This kit includes everything you need to set up the video surveillance system in your home, including a base station with power adapter, ethernet cable, magnetic camera mounts, screws, batteries, a quick start guide and a window decal – everything required to get you up and running, including of course one HD camera measuring 239 x 129 x 297mm and weighing in at 1.33kg, plus you can easily add more cameras to the system if you wish. The only thing not included, is the iOS, Android or Kindle device you will need if you want to monitor the system remotely!